Enjoy am escape from the day to day in this nautical themed beach condo. 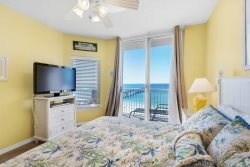 This 1 bedroom, 1.5 bath, 9th floor Gulf Front condo, directly on Navarre Beach. Accommodations include a King Bed in the Master Bedroom, a Sleeper Sofa in the Living Room, and built-in Bunk Beds for a little extra sleeping space just encase the "family Tides". Front desk staff was super helpful at check-in and when it came time to leave they went above and beyond to help us choose a larger unit for next year! Great location, next to the pier and the Navarre Properties and HOA staff were the absolute best!! I liked the condo a lot, and if someone was looking for a condo in the area, I'd definitely recommend. Clean relaxing and always hating having to leave. We love coming every year! Thank you for making vacations wonderful for our family! Quick, easy, friendly and accommodating. What else do you need? I'm not sure how it could have been better. If I had brought my own pillow maybe? Maybe? your security guard Doug was most nice and helpful. there were several very young children running around without adult supervision and he remedied the issue. We had never seen this many small children around the pool without their parents. They were great and offered up tips and advice for items around the resort and also activities to do during the week. We absolutely love coming to Navarre Beach and staying at the SummerWinds resort. They treat you like family and you can relax and have a good time knowing that you have a feeling of home with you.